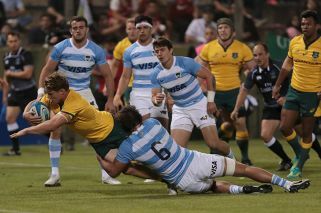 Argentina defeated in Salta after shock turnaround by Wallabies. Australia wiped out a 24-point half-time deficit for a stunning 45-34 Rugby Championship triumph over Argentina in Salta Saturday to ease the pressure on under-fire coach Michael Cheika. There have been growing public and media calls for Cheika to be axed after six losses in eight matches this season ahead of the trip to South America. After trailing 31-7 at half-time, the Wallabies ran in five second-half tries and the recalled Bernard Foley slotted all seven of his kicks at goal during the match. The remarkable comeback outdid that of champions New Zealand earlier in the day when they trailed by 17 points on the hour before snatching a 32-30 victory in South Africa. New Zealand completed the six-round southern hemisphere championship with 25 points while South Africa were second on 15. Australia were third in the table with nine and Argentina bottom with eight. Down and seemingly out at half-time after being dominated, the Wallabies took control from the second-half kick-off and inched ahead 35-34 on 65 minutes. A second try from Dane Haylett-Petty stretched the lead to eight points before Foley kicked his only penalty to seal success. While the win will come as a huge relief to Cheika, there are far more formidable obstacles lying in wait soon. They must tackle New Zealand a third time after two heavy losses this season in the dead-rubber third Bledisloe Cup match in Japan on October 27. Then comes a tour of Europe where Wales and England lie in wait, along with lesser lights Italy. Argentina suffered a serious blow after 29 minutes when star fly-half Nicolás Sánchez had to retire injured and was replaced by Santiago Gonzalez Iglesias. It took the Pumas just 105 seconds to go in front as Pablo Matera ran a brilliant angled line to take the ball and burst down the middle for a try that Sanchez converted. A bad start for the Wallabies got worse on four minutes when Reece Hodge was dispossessed and two passes set up Emiliano Boffelli for a run to the line with Sanchez converting again. Australia skipper Michael Hooper powered over from close range after clever running from a line-out and Foley converted to leave his team seven points adrift. But that was as good as it got for the visiting side in the opening half as Argentina scored two more tries and a penalty before a near-capacity crowd in the 20,000-seat stadium. Patience and powerful running ended with Matias Orlando going over between the posts on 27 minutes and Sanchez converted before being forced off. Iglesias had been on the field less than two minutes when he scored a brilliant solo try, including a swerve that left Foley for dead. Iglesias converted his try and slotted an angled penalty to give the Pumas a 24-point advantage by the break. Apart from the four tries, Pumas coach Mario Ledesma will have been pleased by far better scrummaging after being humiliated by New Zealand's pack last weekend. Izack Rodda triggered the comeback by going over for a try on 44 minutes which Foley converted. It opened the floodgates and mesmerised Argentina conceded further tries to Israel Folau and Haylett-Petty, with Foley adding the extra points. Iglesias scored the only Argentine points of the half from a penalty for a 34-28 lead, but David Pocock barged over from a scrum and Foley converted for a one-point lead.